Join us for a reading group discussion of The Doomsday Book by Connie Willis!For Kivrin, preparing an on-site study of one of the deadliest eras in humanity's history was as simple as receiving inoculations against the diseases of the fourteenth century and inventing an alibi for a woman traveling alone. But a crisis strangely linking past and future strands Kivrin in a bygone age as her fellows try desperately to rescue her. In a time of superstition and fear, Kivrin—barely of age herself—finds she has become an unlikely angel of hope during one of history's darkest hours. 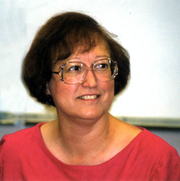 Connie Willis is one of the most prominent women Science Fiction/Fantasy writers and has a distinguished career that includes winning both Hugo & Nebula awards. She appears in our store courtesy of the SF group ConStellation - and all proceeds of book sales will go to benefit this wonderful group that encourages reading and enjoyment of Science Fiction & Fantasy. San Diego’s longest running Science Fiction convention welcomes author Guest of Honor Connie Willis, as the convention celebrates “There and Back Again: Journeys in Fantasy and Science Fiction.” ConDor 20 will take place at Fashion Valley’s Town and Country Resort from Friday, March 8, through Sunday, March 10. Mysterious Galaxy will be in our traditional location in the Dealer’s Room. Find more information on other guests and convention specifics at ConDor's website. Read and discuss Doomsday Book by Connie Willis. By means of time travel, science fiction, and historical reconstruction, this novel comes face to face with the horrible, unending suffering of the Black Death that would wipe out half the population of Europe. -- Publisher's Weekly. Connie Willis , To Say Nothing of the Dog. Connie Willis is currently considered a "single author." If one or more works are by a distinct, homonymous authors, go ahead and split the author. Connie Willis is composed of 8 names. You can examine and separate out names.